The new police chief for Armagh, Banbridge and Craigavon is Superintendent David Moore. Of his priorities for the new post, he pointed to tackling the scourge of drugs, continuing to reduce the number of burglaries being committed and tackling anti-social behaviour. He was also keen to highlight the push to reduce the death toll on our roads. On the new policing structures put in place he said all would be done to ensure each area would receive the full benefit of the new arrangements. A widely experienced officer - just last week he passed his 20 year mark in policing - he has served in a variety of posts with both the RUC and PSNI. He said: “It has passed by in an absolute flash, particularly in the last couple of years where we have undergone a series of restructurings and it has seen me move on more occasions than you might ordinarily expect. “The advantage for me is that I have a very broad range of policing experiences both in geographic policing - which is the type and style of policing that I’m happy to be doing now, and in specialist posts in operations branch and a couple of stints in the investigative world. He started his career in Armagh and said he was delighted to be coming home: “It is a place I remember with huge fondness. A lot of people describe Armagh as one of the best kept secrets in policing. One of the defining features of this new district we have created is that we have a massive spread and variety of policing challenges and opportunities. Roads safety is an issue very close to Mr Moore’s heart, as a former Head of Roads Policing. He said: “When you consider all the other policing challenges we face, if you are a young man living here at this time the most likely way you’ll meet a violent death is behind the wheel of your car. We never take our eye off that. His key message to drivers - people must drive in a manner consistent with road conditions and watch their speed. The speed limits aren’t targets, they are the very upper limit of the speed you should be driving at assuming the conditions are good. In bad weather reduce speed. Of his priorities for the year ahead, he said those had been given to him by the people of the area with a series of policing plan targets - amongst those the scourge of drugs is almost ever present: “We are in the middle of operation Taurus here, the police service is raising its game with regard to those dealing in drugs. “We are also looking particularly at the scourge of domestic burglary which is on a long term downward trend. In this area and at this time you are more safe from the threat of your house being entered than you are in almost any other part of the UK. You are safer than you were five years ago and we intend maintain that push. “We’ve been focusing most recently on the elderly and in recent months we’ve driven down the number of burglary attacks on senior citizens by ten percent and need to maintain that and expand that into other groups. 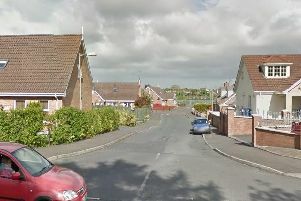 On the issue of a move for Portadown Neighbourhood team he revealed they would be staying in Portadown at Mahon Road. Pointing to the restructuring exercise, he said it was critical the police were able to work with key people, such as the new councils, so they had redrawn their boundaries to match those of the super councils. It’s important to retain the principles of Patten, he added, but for too long they had been over reliant on those teams and they want to crack the nut of getting other officers working in that way too. Money was also a driver as the PSNI used to be a billion pound organisation but their new budget, when set, will be closer to £600 million. There have been significant reductions in people and in money. Police he said could not be immune from cutbacks. He said they were trying to look at ways of getting more local policing done with fewer resources. “We will be creating new local policing teams. We are going to base them at two locations, one in Lurgan and the other in Armagh. Those teams will be a blend of neighbourhood and what you currently understand as response policing. “Those response police have spent the last few years rushing around, more often with their blue lights on, going from call to call do what they can to fix a problem and then inevitably being dragged away to deal with the next one. “Neighbourhood, in much smaller numbers, have had the time and space to address the quality of life issues, to problem-solve and to get some meaningful partnership work going. While we have been hugely successful at that we need to expand that ability right across the board. “The local policing teams are going to be much bigger, they are going to be by necessity concentrated in smaller areas, we have to think about our estate. But we’re leaving behind specialist neighbourhood policing in those area where we have judged it is not right to simply remove all of this expertise. We’re going to have those neighbourhood teams, one based in Lurgan and two based in Mahon Road, Portadown - one will cover Brownlow and one which will cover Portadown and one based in Armagh. He said they had looked carefully at where those teams would be sited, they are not using Banbridge to site teams as police estate has been shrinking. Police have been investing heavily in technology, using a system called Locate to give live time picture of where police officer is. He pointed out police would still be maintaining a presence in Banbridge but would be providing other policing services. Addressing the dissident threat he said his role was to police in a style that keeps people safe while allowing dissidents little room to operate. “The reality is we don’t know what we’ve got until we know what we’ve got. Now that doesn’t mean every report will result in the closure of a road or the railway, there are plenty of occasions it does not but of course people will see more often that not that which is obvious. “It’s a difficult one for us because we have a very finely balanced judgement to make. I will never take risks with the safety of anyone in this community, I will never take risks with the safety of my colleagues. There are times when policing is a risky business, we all put ourselves in danger but I will never do that with the safety of the community.